A Boxfish or a Cowfish? For the longest time, I have been visiting my LFS to see what new treasure I would find there. A particular store would periodically receive boxfish and cowfish. I was immediately drawn to these curious fish – who wouldn’t be. After speaking with the staff there, I was more intrigued on how such a dangerous fish (can release toxins) would be a candidate for the reef aquarium… well after a lot of research and posting online, I decided to jump in and get this little cow fish – scrawled cowfish to be exact – my LFS referred to it as an Atlantic Longhorn Cowfish (Acanthostracion Quadricornis). I have had for a few weeks and he is doing great! He loves my tank, and the other fish leave him alone… he is also eating frozen mysis out of my hand… very cool fish! On April 20th, I received my tiny red angler. I thought he was a warty, but I think he is actually a tiny painted angler. He is very cool and settling nicely in the sponges. On May 2nd, I purchase two Flaming Prawn Gobies for the Spec. 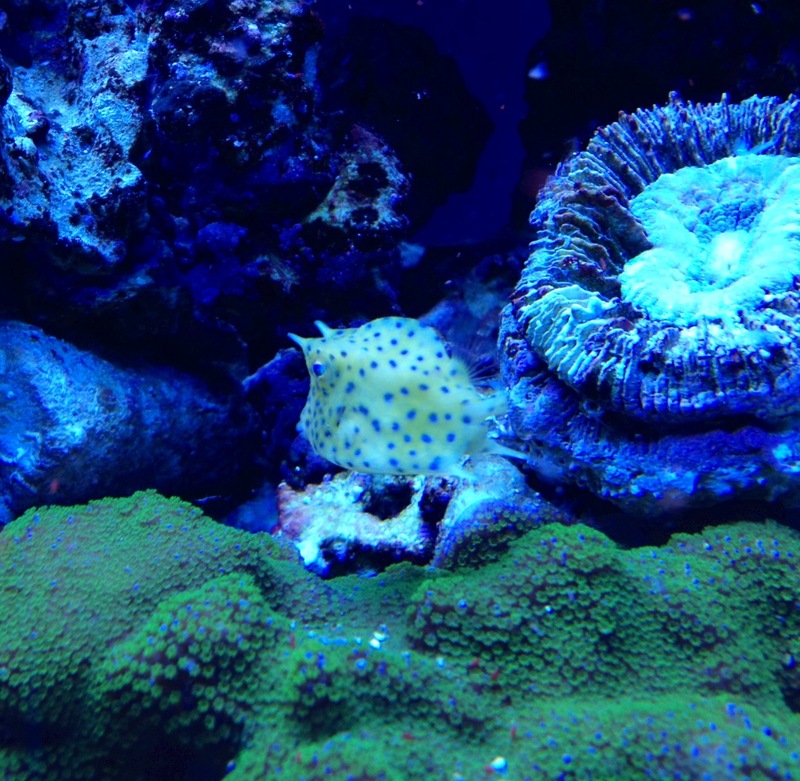 The Spec now has feeder shrimp, Harelquin Shrimp, feeder starfish, and some very cool gobies. On May 7th, I purchase a Randalli’s Red and White Pistol Shrimp for the Flaming Prawn Gobies in the Spec. I also purchased a female Harlequin but looks like it didn’t get along with my male and did not make it. Of course I received some cool items for my 57g at home – Blue Porcelain Crab, Anemone Crab, and my greatest fine… tank acclimated Blue Tangs – tiny… but eating and doing well. Now that we are back home and settled in again, I decided to spend some time on my aquarium. Although I was happy with my progress, I lost a little bit of the excitement. I decided to change things up a bit and took back a bunch of coral to my LFS – huge candy cane, huge confusa, red chalice, blue chalice, rainbow acan, pastel war and peace favia, etc…. This gave me an opportunity to get a Aussie Warpaint Scoly and a juvenile Mystery Wrasse!!! It is very exciting – I also found a Strawberry Cowrie – interesting addition. 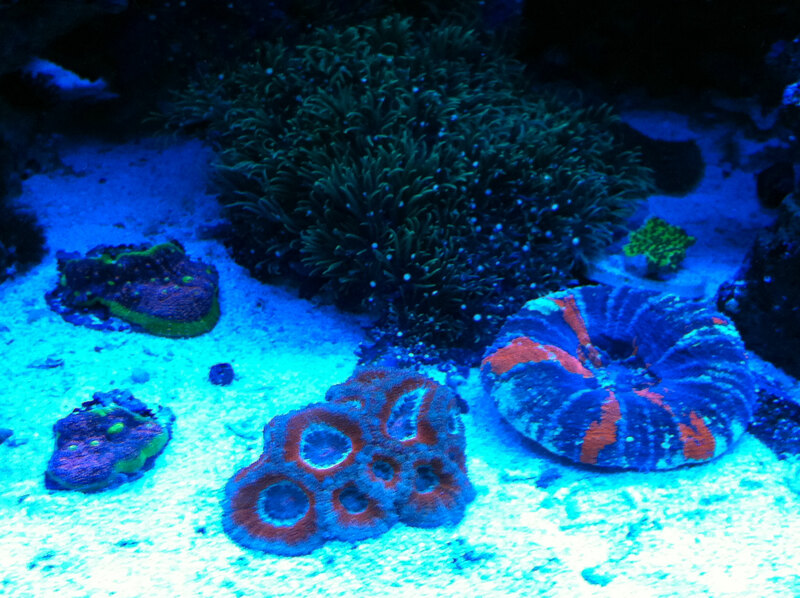 Definitely some big changes and some new excitement on my tank… Here is a quick pic of the Scoly. It has been a while since my last post. I am still making progress in the new setup. The biggest battle I have faced is maintaining my pH… Calcium and Alkalinity look good, but something is still off. I began measuring Magnesium; I was surprised how low it was! I am dosing MG in addition to CA and ALK. The second battle has been around Chromis… I have been wanting a schooling fish… after several attempts, I was determined that I was doing something wrong. I started asking my LFS and reading online, and I was shocked to learn that Chromis fish are typically caught using cyanide! This leads to an enormous amount of lose… I finally got another batch… carefully inspecting them for any sign of distress or infection. It has been 10 hours but they are looking good and a wonderful addition to the aquarium.